Family and friends are preparing to say goodbye to a Poway teen, killed while driving home from college for during Christmas break. POWAY, Calif. (KGTV) - Family and friends are preparing to say goodbye to a Poway teen, killed while driving home from college for Christmas break. "She always brings a positive vibe wherever she goes. Her smile can really brighten up the room," said friend Brandon Kim. For the friends of Kim Huynh, smiles for them are hard to muster. "To me it was just shock," said Kim. 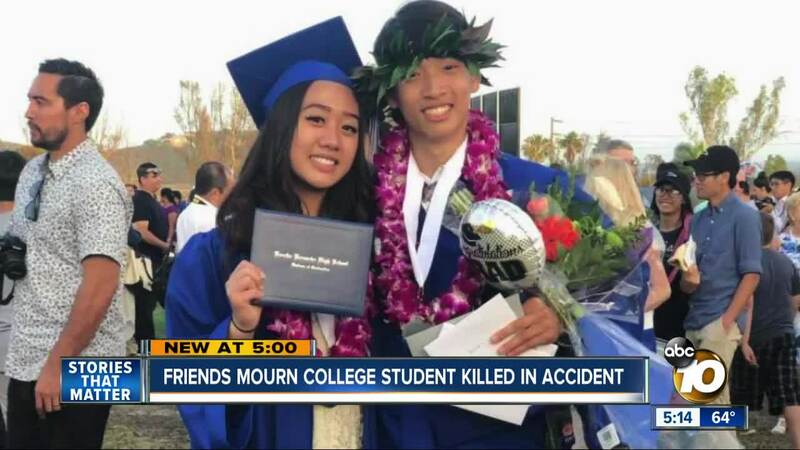 Last Thursday night, the 18-year-old Huynh was driving back home to Poway with her older sister after finishing her first quarter at UC Riverside, when the car spun out on a Murietta highway, slamming into a tree and killing her. Her sister suffered minor injuries. The cause of the crash remains under investigation. "She was one of my closest friends," said Kim. Kim met Huynh in grade school. "Super smart. Ten times smarter than me," said Kim. Kim said his friend also had a joyful side and loved having fun. Huynh danced for one of Rancho Bernardo High's dance teams. After graduating, she enrolled at UC Riverside on scholarship. The pre-med student also hoped to help her immigrant parents. "She said she wanted to become a doctor to give back to them for taking such good care of her," said Kim. After her death, friends gathered this weekend to remember a promising life cut short. "Everybody broke down ... I want to grow up with everyone. The fact I have to leave someone behind breaks my heart," said Kim. The funeral is planned for Thursday. A Gofundme campaign has been set up for the family to help with expenses.